By now regular readers will know that I get together with friends on a regular basis to play Dungeons and Dragons. Two of my friends, Scott and Mike, have characters who wield the fearsome "eldritch blast," a magic bolt of energy used to fell foes. 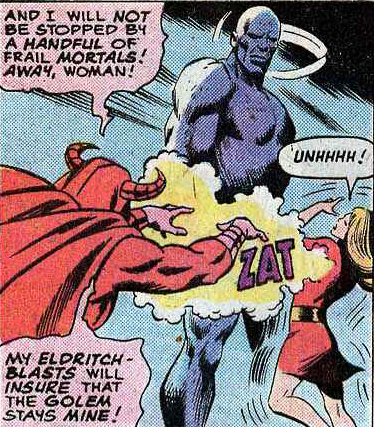 In this panel from an issue of Marvel Two-in-One, a magical miscreant uses that very power to assault an innocent bystander. According to the Oxford dictionary, eldritch means "weird and sinister or ghostly." The spell's name is therefore thematically appropriate for Dungeons and Dragons and comic books alike; on the other hand, I'd hate to have to tell an ER doctor that I was hit by "weird, sinister or ghostly energy." It wouldn't give her much to go on. D&D clerics, presumably, would know exactly what to do. Labels: comics, Dungeons and Dragons, Magic, Marvel Comics, Marvel Two-in-One, Mike T, popular culture, Scott F.